Moog Music announced a free software editor for the popular Sub 37 this morning. This long-awaited expansion represents a major in-house effort by the Asheville builder and will enable users to craft individual patches and presets for their hardware synth. The Sub 37 Editor, a digital software-companion to the Moog Sub 37 Analog Synthesizer, is now available to registered owners as a free download. Operating as a Plugin or Standalone software (VST, AU, RTAS, and AAX Compatible), the editor delivers immediate access to the Sub 37’s hardware parameters, while also serving as a bridge between the Sub 37’s analog circuits and contemporary digital audio environments. Diving deeper into the Sub 37's sound design capabilities, the editor contains over 250 new presets, including four banks from the sonic alchemists at Trash Audio. Alessandro Cortini, Surachai Sutthisasanakul, Justin McGrath, and Richard Devine explore the Sub 37's inter-modularity, offering artists a unique collection of experimental patches within this complex analog instrument. 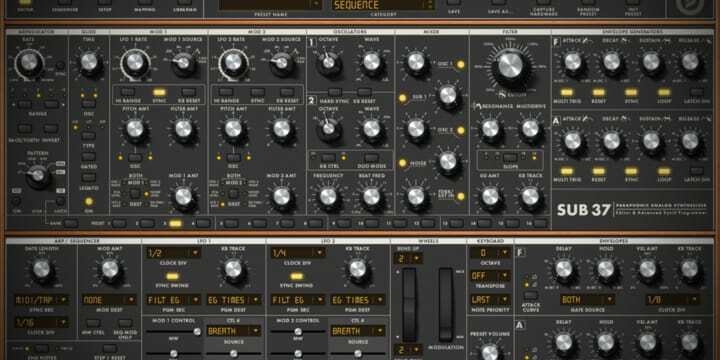 Sub 37 owners can register with Moog for a download of the editor and latest firmware update. Those without a Sub 37 in their arsenal can find one on Reverb here.